Just as Fukuoka is gearing up for its grand annual Matsuri (festival), our time here is coming to an end. At least we did get a chance to see several of the festival floats, all decorated and ready to be paraded on the climactic day of the festival in mid-July. We had a fabulous time in Kyushu, so full of fun, travels, new challenges and interesting adventures. In the two months we spent in Kyushu, we visited a few Onsen (hot springs), continued studying Japanese and improving our language skills, and walked a small pilgrimage in neighboring Sasaguri, which took us seven days and allowed us to enjoy some quiet beautiful forest walks away from the busy city. We climbed mountains with nobody but the spirit of nature around us, and we visited and prayed in many old Buddhist temples. Beside learning Japanese, we learned techniques of how to draw Japanese Manga (cartoons), started learning how to read and write Kanji (Chinese Characters), and we met lots of lovely people. We had met a woman from Singapore in her early seventies who came to learn Japanese for the first time. She said that just like us, she wants to fill her days with positive challenges and stretch her horizons by redefining what she can do. We explored the healthy food choices around Fukuoka and discovered some fabulous places to eat, and we participated in an evening workshop, learning Japanese manners. When I saw the brochure for the Japanese manners class, I knew that I could not pass it up. ….” Come join us in learning NON VERBAL communication such as consideration and thoughtfulness through manners and etiquette. – Learn how to be beautiful! The way of walking, sitting, standing and SPLENDID BEARING. I have to admit that it was the “SPLENDID BEARING” that attracted me most to participate in the class…. While observing the Japanese society, I have noticed that the majority of people walk with very straight backs, naturally and quite effortlessly. Most people sit with an erect spine as well, and many carry their bodies with unparalleled grace. I know that good posture is developed in childhood and is carried well into adulthood. But even for people who are normally slumping, drooping their shoulders, bending their spines into S shapes and walking ungracefully or even clumsily, it is possible to learn new awareness and start new practices, to correct bad posture. I know that most people learn by observing and imitating others, and not necessarily by verbal instructions. Since Jules and I did not grow up in a Japanese society with teachers to instruct us on such manners, I jumped on the opportunity to learn. The same day of the evening manners class, was the last day of our Sasaguri pilgrimage. It wasn’t possible to walk a lot of kilometers per day, because we had to visit many temples every day, and in each one we took photos, said our prayers, lit incense, and stamped our pilgrimage book, which took a lot of time. We also returned to sleep in our apartment in Fukuoka each day, which made our days much longer, as we had to walk back to the train station, instead of staying the night in one of the many guesthouses made for pilgrims. 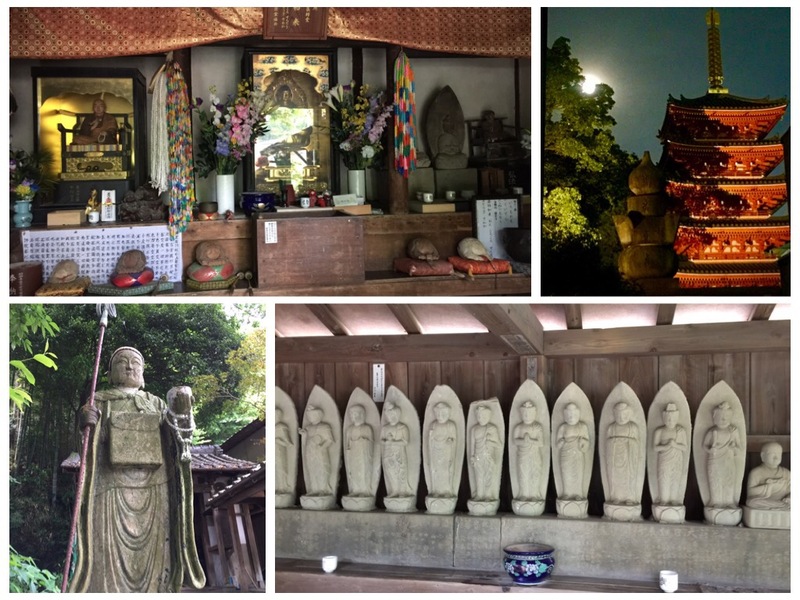 We walked 120 kilometers over 7 days and visited 88 temples. Some of the temples were situated on remote mountain tops, and some were amidst bamboo and cedar forests with only a narrow path cutting through the trees. We had to cross rivers on thin bridges or over slippery rocks, and look for clues on where to find the next rural temple or the location in which they kept the stamp box for the pilgrims, as many of the rural temples did not have a full time attendant and we had to stamp our own book. It was a moist day when we finished the Sasaguri pilgrimage, but the heavy rain fortunately waited until we were back in the city. We headed back to our apartment to take showers and change our clothing, as I did not want us to show up to a manners class dressed in sweaty hiking clothes. By that time, we had moved to a new apartment in the Tenjin area of town. The two major parts of downtown Fukuoka are the Hakata and the Tenjin areas. We divided our time and made bookings to stay half our time in Hakata and half in Tenjin. In Hakata, we stayed in an apartment we booked on Airbnb, but in Tenjin we booked a full service apartment hotel. We loved staying in the Tenjin area, and getting our bedsheets and towels replaced every day. The apartment hotel also gave us daily clean and ironed Yukatas (summer kimonos), which we used to lounge around our apartment. They also helped us to use Yamato, the baggage shipping service, to elegantly ship our suitcases to our hotel in Tokyo, so we would not have to schlep them from Fukuoka to the airport and again from Narita to Tokyo. When we arrived at the Japanese Manners class, the rain had intensified and our shoes were totally soaked. I noticed that many elegant Japanese ladies with flawless figures were wearing rubber gumboots, which I thought was a brilliant idea. As I expected, the manners teacher was an elegant lady. After formal introductions in which our small group introduced itself, she told us that most of the communication between people occurs on a subtle, non-verbal level. She said that in order to operate in the world with elegance, we must become “Mind Readers,” and feel and sense the right thing to do in every circumstance. We must feel and sense what will make others comfortable, will put them at ease, help them, or make them happy and relaxed. We must learn to see how certain behaviors, body manners and postures send out vibrations to others and indicate our true feelings, more than any words anyone can say. She spoke about the correct way of sitting in formal situations, not leaning back on the chair but sitting with our backs erect on the front half of our chair, with our knees close together and our feet forming a slight V shape on the floor. She said we must rest our hands on our laps, and always sit tilted toward the person sitting next to us, not turning away from them. Then she taught us how to elegantly get up from the chair, not by holding or pushing the chair for balance and support, but by using our thigh and leg muscles to get up gracefully. She taught us how to stand with our backs erect and how to walk elegantly, not striding too widely and not tiptoeing timidly. Next she told us that even though it is superficial, we have on average only six seconds to make a first impression. Hair makes up 65% of our introduction to others, and the rest is divided between our posture, looks, smile, attitude and personality. This explains the Japanese obsession with hair styling. There are hair salons EVERYWHERE, and people spend big money on their hair . There are hair salon magazines, and hair salons that operate as part time cafes, gift shops or galleries, and many that are located in expensive real estate locations, with elegant and contemporary designs. How to lift up our chopsticks, slide them into the correct position, lift small bowls in our left hands and slide the chopsticks with the aid of our middle left finger into the right hand. It was elegant to see and I was happy to learn these movements. We learned how Japanese table manners require you to bring your own package of stacked thin paper napkins that are used to collect drops under the chopsticks, and to fold into it any bones or inedible prawn tails, instead of leaving them on the plates. We learned that you must always keep your table area clean and neat, and make sure not to scratch and treat with utmost respect all the lacquerware, old pottery and splendid ceramics, which are often used in serving an elegant Japanese meal. It was a very informative and most enjoyable evening class. I was so delighted that we participated and overlooked Jules’ initial objection to join, saying that it would probably be a class geared towards women. In fact, there were a total of three men and four women, including the owners of the school that hosted the class. I would also like to travel arund the world and do such interesting things. Kindly advise me about such interesting destinations..